My business partner received a call the other day from an old colleague who called her first because he trusted her good judgement and compassionate and caring nature. Her father was scheduled to have a hip replacement surgery in a couple of weeks and while he would have some recovery time in the hospital and then be sent to transitional care for rehabilitation support, the family recognized that the journey to full recovery was going to be challenging for him and they wanted to get services in place in anticipation of her father coming home. On the phone call, my business partner learned that the family was struggling with providing support to the father before his schedule surgery because of his limited mobility. He needed help to get to the washroom and from room to room in their house. His bed had been moved downstairs into the main level den so he didn’t have to climb stairs. Instead of scheduling a post surgery home care assessment which was the original plan, my business partner offered a no obligation pre-surgery assessment to truly understand what the individual client and family needed and wanted and to assess what supports can be organized at home before the surgery takes place. 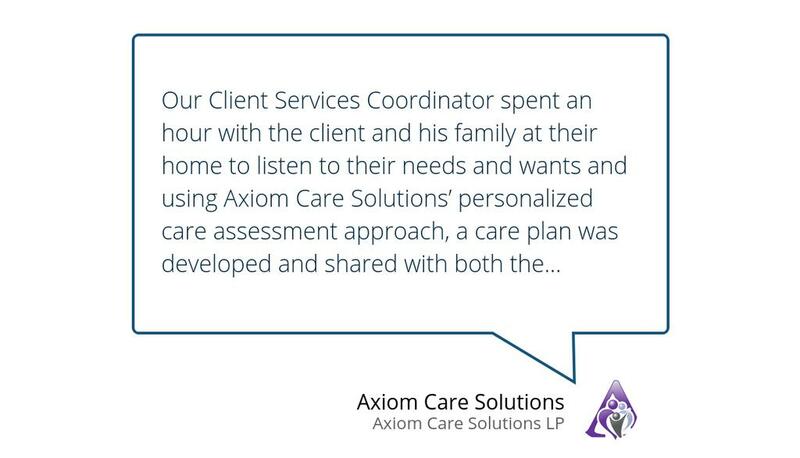 Our Client Services Coordinator spent an hour with the client and his family at their home to listen to their needs and wants and using Axiom Care Solutions’ personalized care assessment approach, a care plan was developed and shared with both the client and his family members. There was good discussion as plans were put in place in place on how the client will be brought home, home physiotherapy was arranged and the type of personal support equipment required was confirmed and placed on hold. The care plan also included the type of home care support that would be required. The plan was uploaded and made available to the family through Axiom Care Solution’s family portal for instant access and review through their smartphones! What they thought was cool was the instant message they could receive to confirm that a caregiver had arrived at their home and was providing the care and they were able to see and track the type of daily care their father was receiving! There’s lots of possibilities when home care services are personalized and customized! At Axiom Care Solutions we provide quality home care with a purpose to reduce stress and uncertainty for our clients and their families. If you are scheduled for a surgery, give us a call to learn how we can help you get organized and ready for your post surgery home care needs!